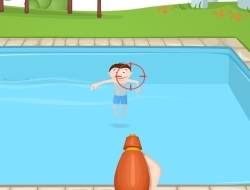 This is a refreshing shooting game in which you will not kill anyone, but instead you will start your normal day at the pool. Little do the people know that this day is going to get a bit crazy as soon as you arrive, as you will take your water gun and start shooting at everyone. Well maybe not everyone, as the little girls are to be avoided and you should concetrate on squirting the old boring people that wont let you splash or jump into the pool. Show them a good time and try not to lose your lives too early. Also you should refill your water tank as soon as it depletes so you can get right back on it and start shooting at them. Use the mouse to shoot and the Space bar to reload. Water Gun Shootout 0.00 between 0 and 10 based on 0 votes.